Do you love walking and/or running? Do you want to improve your fitness level or maybe lose some weight? You need to do some physical therapy to recover from a surgery? Do you want to have someplace to run when the weather is awful? If the answer is ‘yes’ to any of these questions, you should definitely browse through 8 of the best treadmill reviews to find the perfect indoor running machine for your needs. 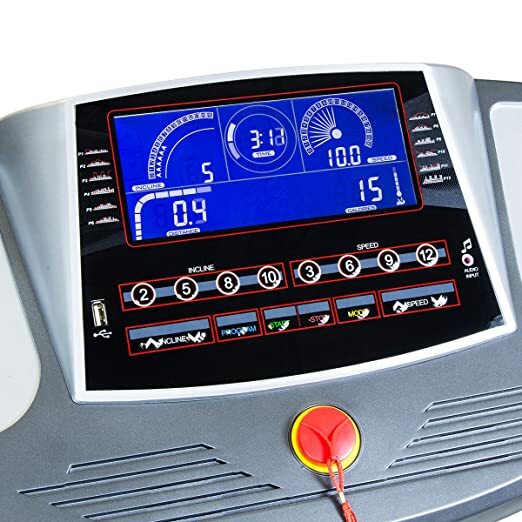 These reviews compile different running machines that fit a variety of purposes. Keeping your options open is important, but so is reading critical reviews, that emphasise both the negative traits, along with the positive ones. At first, we’ll discuss the things you need to consider before buying a running machine. But before that, if you’re in a rush, here are the 8 treadmills we’ll talk about in this article. Further down you can read each individual treadmill review. The manual ones are lighter, more compact and way more affordable, but you need to keep your hands on the handles all the time. That can be a real issue for taller people, and it can also cause some back problems, considering that most manual treadmills don’t have an adjustable height for their handles. When it comes to manual treadmills, there’s no maximum speed limit, which motorised treadmills have. However, some electric treadmills offer a pretty high max limit, and they’re also sturdier. 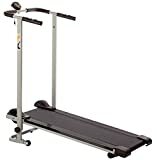 Manual treadmills are also known to cause joint friction, therefore it is safer to exercise on a motorised treadmill if you want a running machine for constant use. 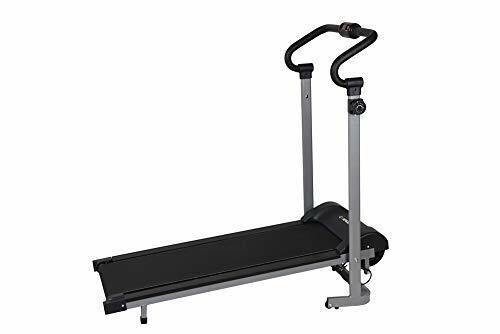 On the other hand, a manual treadmill is way better for your joints than running on cement, so they’re a good choice for people who want a basic, budget running machine. However, there are plenty of affordable and reliable electric treadmills on the market that are able to offer you some great workout features. If you want to benefit from a challenging workout, you need more incline levels. On the other hand, if you’re a beginner, or in need for physical therapy, a 4 – 8% fixed incline is more than enough, considering that treadmills with a low, fixed incline also cost less. Still, if you’re after more incline levels, make sure the transition between them is quite smooth. Some of the best running machines out there also have a decline option, which means you’ll be walking or running downhill, so you can target different muscle groups. If you’re getting a manual treadmill and want to up the challenge, make sure you get different resistance levels too. It’s always a nice idea to have the option to improve, even if you’re a complete novice at running. The more programs your treadmill has, the more chances you have of getting better and meeting your fitness goals faster. That’s because it’s easier to find programs that suit your specific needs and plans. Besides, multiple programs are also great for increased motivation and for accommodating your day-to-day mood and stamina. On the other hand, treadmills that boast more programs can be more expensive. It’s also important to check that you can customise your workouts if you want to plan your weight loss journey to the max and gain endurance in an effective manner. If you’re a beginner not interested in improving your speed too much, a 10 – 12 km/h speed can be good enough. However, high-end treadmills offer a bigger speed limit of over 20 km/h, which is great for more experienced runners. A big max speed can really challenge you, but it’s also important to check the smoothness of the transition between the speeds. This is very important for choosing the right model, you should get that out of the way at first to stop you from falling in love with the wrong running machine. 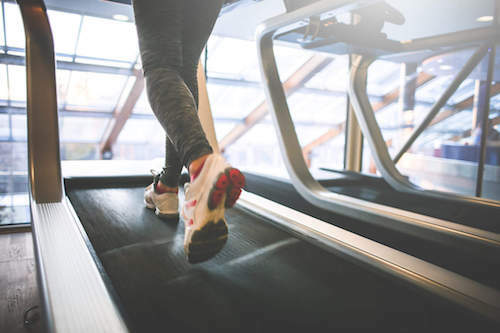 The general rule is that manual treadmills have a lower upper weight limit than electric ones, but that’s not always the case. You should also know that a treadmill which allows a very high max user weight might cost more and is probably heavier. 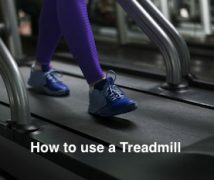 That’s because this sort of treadmill has to be more durable, which means a higher quality and a higher quantity of materials have been used to manufacture it. This should also be a top priority for you, especially if you have a bigger frame. Generally, smaller, thinner people can get away with a smaller runway area, but this also poses some safety issues. A rule of thumb is that gym treadmills have very wide, accommodating belts, and so do more expensive treadmills. You should also check that the belt is non-slip, so you can avoid accidents. 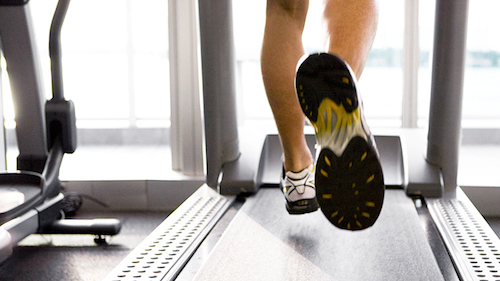 There are plenty of stats the majority of treadmills offer, like speed, distance and time. Some of them even display burnt calories or your heart rate, if they have built-in pulse sensors or a chest strap. However, make sure these stats are as accurate as possible, particularly if you depend on them to organise your fitness plan. The display also matters, so make sure these stats are easy to read, which means the screen has to be wide enough. A second thing to look out for is that the display can be easily operated, so you don’t lose time fiddling with it. This is an important factor if you don’t have a lot of space in your home, or if you’re planning to store the treadmill for the warmer seasons. If you lack space, get a more compact, lightweight and foldable treadmill, with transport wheels. Still, keep in mind that compact and light treadmills are less sturdy, which might decrease their retail price but also their durability. They usually don’t have such a good upper user weight limit, but they can definitely offer you the basic functions of a reliable treadmill. Entertainment might be considered superfluous by expert runners and gym rats, but it’s great for getting you in the right zone, as well as helping you find the right motivation. For those scenarios, a good iPod or MP3 socket, or some built-in speakers can work charms. 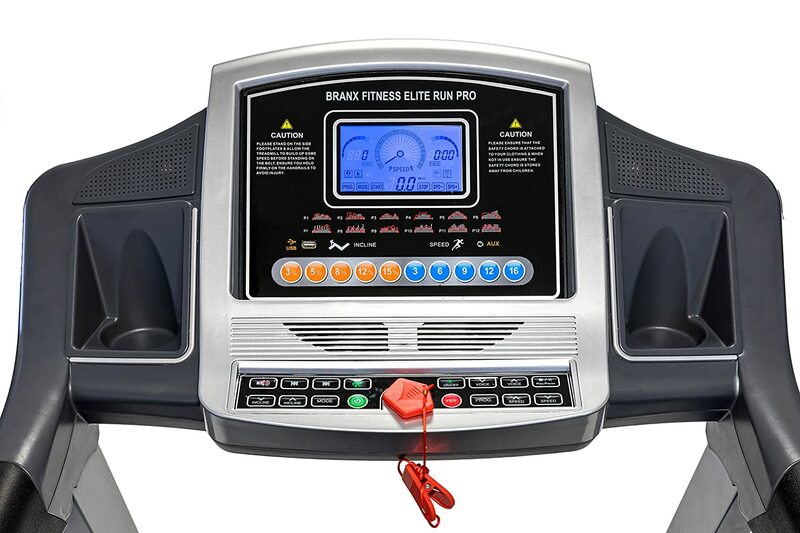 High-end running machines offers Bluetooth or Internet connection if you want to synchronise it with another fitness device or a fitness app. That will help you reach your fitness goals faster and easily share and compare your progress with your friends. You should check for some useful extras, like bottle holders or towel racks. If you’re doing high-intensity workouts, you need to rehydrate yourself and wipe your sweat, and it can be really irksome to constantly stop and get off the treadmill for that. In these treadmill reviews, we’re going to tackle different running machines, each with their best uses. We’ll also discuss them objectively, assessing both their pros and their cons, to make sure you get the best treadmill for your specific needs. As mentioned before, the manual treadmills are cheaper and more compact. They are powered by yourself, giving you total control over the desired speed. We’ll review 2 of the most popular and affordable manual treadmills that you can currently buy online in the UK. Both of them are lightweight and foldable and they’re ideal for someone that wants a basic running/walking indoor machine and is willing to spend around £100. Between these two, we would recommend the Confidence one. The V-fit MTT1 is the best cheap manual treadmill. If you’re on a tight budget and you’re more interested in power walking, this treadmill is great for beginners. A manual, magnetic machine, the MTT1 has a fixed 8% incline. It has an easy setup and roller wheels for increased portability. Don’t forget you can also fold it, therefore great in terms of storage. Being compact, it has a small running deck, 100 x 30 cm. However, this manual treadmill can accommodate people up to 100 kg, and we love the tubular steel frame of the MTT1 because it’s quite resistant. However, the screws need retightening every once in a while. With its 6-function LCD monitor, you’ll get plenty of stats so you can keep track of your progress. On the other hand, sometimes the display resets out of the blue, which is weird, to say the least. 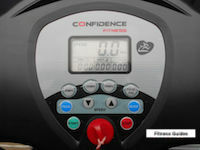 This Confidence treadmill is one of the best value manual treadmill that money can buy. For such an affordable machine, you’ll love its magnetic resistance that allows 8 different levels you can adjust according to your own fitness level and goals. However, you only get a fixed incline that’s not very steep, which might be great for beginners, or people recovering from injuries, but not so great for intermediate or advanced levels. Even so, keep in mind that the max user weight allowed is 100 kg and that the runway size is 38 x 102 cm. 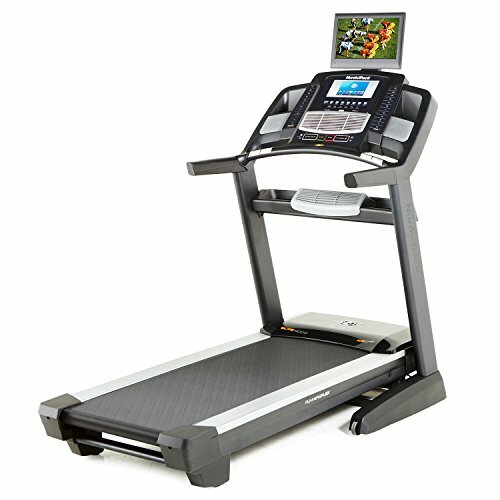 We love the multi-function computer this treadmill uses to measure speed, distance, calories, and time, with a good degree of accuracy. The handlebars are really strong, and that’s great for people who are doing physical therapy, as you can always lean on them for a quick rest. Other than that, this treadmill is very silent and quite smooth, which is surprising for such an affordable item. Besides, the fact that it’s portable and easy to store is great, thanks to its locking pin mechanism and its wheels that allow you to transport it from one place to the other. 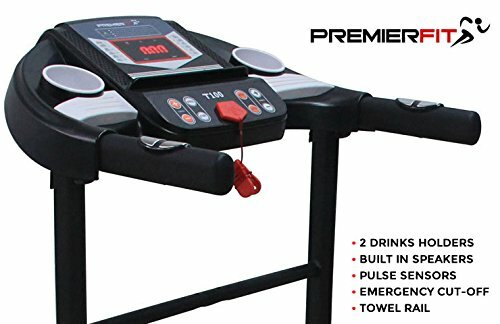 Moving on to the world of motorized treadmills, the PremierFit T100 fits snuggly in the category of best value treadmills, with its sturdy build and multiple exercise programs, 12 preset and 3 manual. We love the wide LED display it has as it’s so easy to read the program details, along with your time, speed and burnt calories. But more than that, the T100 is very user-friendly and it shows that PremierFit understands the importance of motivation for working out. That’s why it boasts an iPad holder and built-in speakers so you can keep yourself well entertained while you’re working out: watching a TV show or listening to music. And the best is that the sound played is really high-quality for such an affordable machine. There are also two individual bottle holders so you can remain hydrated during your workout session, and run for as long as you want, as well as a towel holder. On the other hand, the maximum speed this treadmill allows is just 10 km/h, and there’s a fixed incline of 4%, even smaller than the 8% offered by the manual V-fit MTT1. Yet again, this is a folding treadmill, which is really great for storage purposes. With an easy assembly and very clear instructions, along with all the needed parts and tools, you can take it down and put it on again in no time. Besides, you’ll get an awesome 2-year warranty for the frame and parts, as well as a lifetime warranty for the motor which is again surprising for a budget treadmill. On the other hand, the maximum user weight allowed is very low, just 90 kg. The Confidence Gtr Power treadmill also fits in the category of best budget motorised treadmills. It does its job with flying colors, although it lacks the bells and whistles of a more expensive device. That said, the maximum speed you can get with this treadmill is just 12 km/h, which might not be as much for an expert level. Still, it’s great for people who want to build up their stamina and aerobic endurance. You also get an adjustable incline to make your workouts even harder, but there are only three levels in total, which again might not prove enough for pickier runners. We love the foldable design though, it’s really easy to store this treadmill, and the 120 kg weight limit is accommodating enough for a decent category of people. We also love the emergency stop clip, that you simply attach to your clothes and the machine stops if, by accident, you fall. However, the belt can slip sometimes, but that’s easily fixable during routine maintenance. That said, you will also notice how easy it is to read the multi-function LED display because it’s quite large. You’ll even get a heart rate monitor along with your speed, distance, time and calories. However, this one you should take with a pinch of salt because the heart rate isn’t extremely accurate. 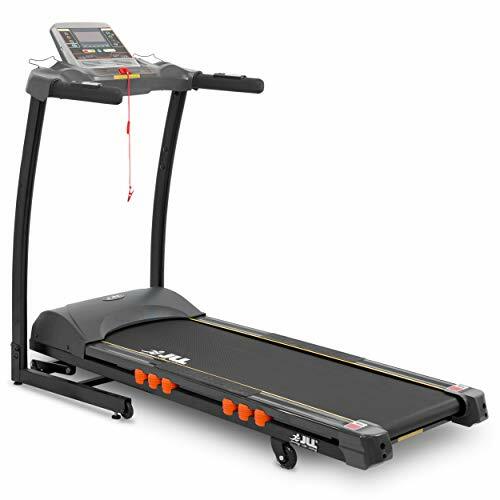 If you’re in the market for the best treadmill for home use, this Charles Bentley machine definitely offers a good price-quality ratio. 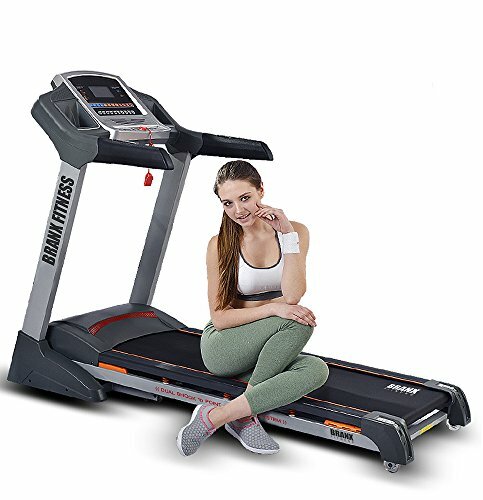 With its 12 workout programs and 0 – 15% adjustable incline, you can easily set the difficulty of your training sessions, and the 0.8 – 14 km/h speed range is quite accommodating. However, this incline might not prove challenging for expert runners, and the 126 x 41 cm running area might also prove better for people with smaller builds. You can read your stats on an LCD console display that’s easy to operate and read, including your heart rate. There’s even a BMI (Body Mass Index) analyser, which is great for an added insight into how you should structure your workouts. We love the construction and design too. 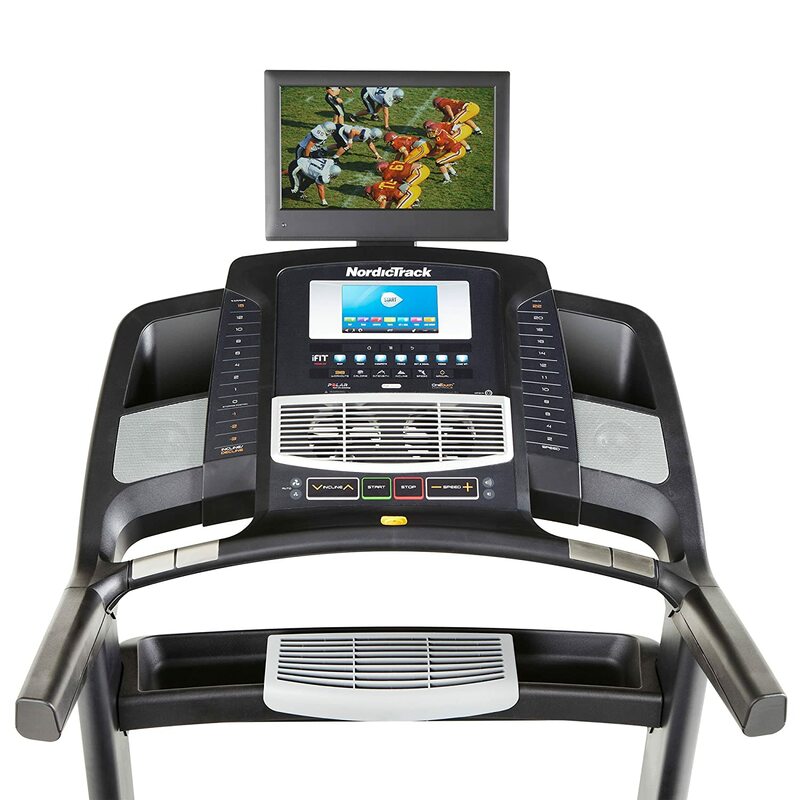 With a 1688 W motor, this treadmill can definitely offer you some intense workouts. The running belt is anti-shock and anti-slip, which is amazing in terms of cushioning and grip, protecting your ankles and knees. The frame is also very resistant, manufactured from iron steel, while the handles are easy-grip and comfy, made from PU/PVC and covered with foam. In terms of design, the automatic hydraulic folding arm is definitely a plus, and this treadmill is foldable and easy to store and move around thanks to its transport wheels. There are other bells and whistles too, like the safety lock, water holder and MP3 and USB connection for good entertainment options. The 120 kg max user weight is another plus. 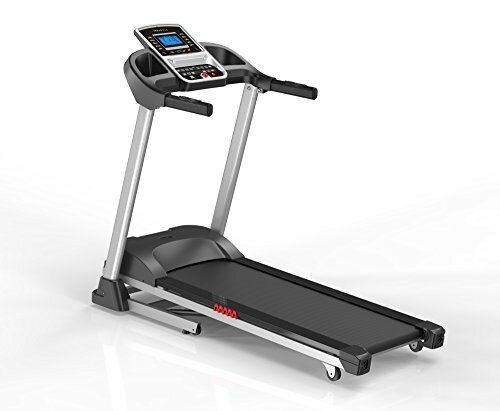 The JLL S300 is a reliable mid-range treadmill, and one of the best running machines for home use, although it’s a bit heavy and the running deck isn’t as wide as that of a gym treadmill, though it’s a decent 123 x 41 cm. Still, it has a wide speed range, from 0.3 to 16 km/h. And the best thing is that you can move very smoothly between these speeds, in 0.1 km/h increments. You also get 20 different levels of incline, which is again great to fit different fitness levels and to provide a smooth transition between them. We love the 15 running programs offered, three of each you can customize yourself. And you can read your stats on a wide 5-inch LCD monitor, including your heart rate stats. Still, some of the metrics should be taken with a pinch of salt, the built-in sensors aren’t as high quality as those of medical equipment. Plus, we love that the S300 is heavy on the entertainment too, with built-in speakers, as well as iPod, iPhone, MP3, and USB connection to ensure you’re keeping your running motivation. It’s also really comfortable to run on this treadmill, with its 16-point cushion deck that protects all your joints, so you won’t get sore ankles or knees. 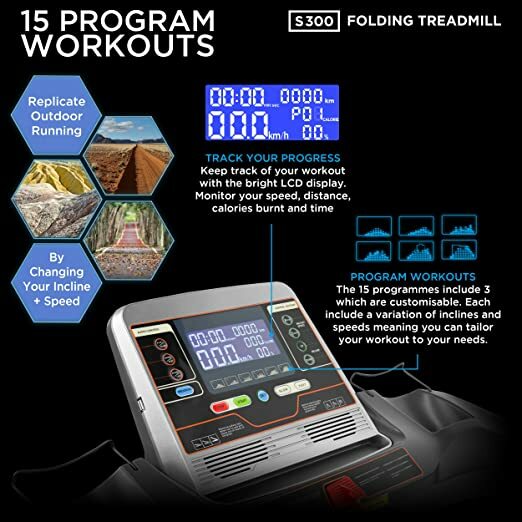 What’s more, we appreciate the overall user-friendliness of this treadmill, which allows a max user weight of 120 kg, and also offers reliable warranties: 2-year parts and labor warranty, 5-year motor cover warranty, and a valuable lifetime frame warranty. In the world of the best high-end treadmills for home use, the Elite Runner Pro definitely takes the cake, and it’s definitely for elite runners. 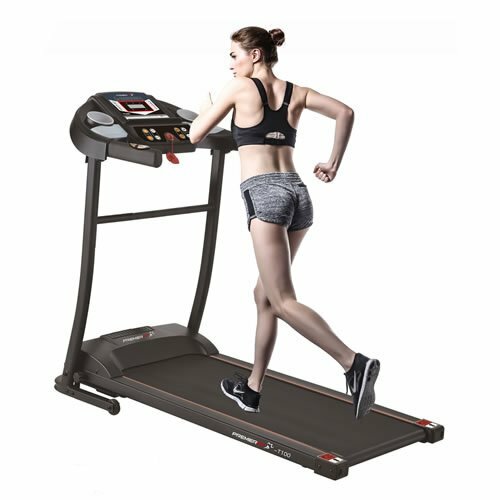 With its soft drop system and easy move, this treadmill is very comfortable and protective for your joints, while the 3.5 CHP motor is really powerful. With a 23 km/h max speed, only Usain Bolt could find something to complain in regards to that, and the 0-22 level incline is wide enough to fit different preferences. With 19 programs to choose from, the wide range of workouts you can do is definitely great. We love that the max user weight is 160 kg, which is a significant improvement compared to the other treadmills reviewed here. And thanks to the dual shock 10-point absorption system, this treadmill will prove cushiony for anyone. However, keep in mind that the Elite Pro is a really heavy machine, so it loses points on the portability scale. Don’t forget you can fold it, and that there’s a plasma cooling fan built-in for your more strenuous workouts. With great warranties of 2 years for the parts and labor and 5 years for the frame, you can rest assured of the high-quality of this treadmill. You can use the display to get accurate readings of your speed, distance, time, calories, as well as your heart rate. And if you get bored running, you can always spice things up with a little musical motivation, thanks to the MP3 socket and built-in speakers with crystal-clear sound. The NordicTrack Elite 4000 redefines the meaning of home treadmill in multiple ways, starting with its expensive retail price, which takes you out of the price pool and onto the highest peak. With its 4.0 CHP motor with a 6.0 HP peak and a speed range of 0 to 22 km/h, this treadmill is definitely on par with most gym treadmills. The incline range from -3 to 15% is quite unique, considering you have that decline that works your muscles in different ways. However, we have to admit – the max +15% incline isn’t that accommodating for expert runners. Still, you have to appreciate the wide running area, of 55 x 152 cm, as well as the Runners Flex cushioning. And although the max user weight is 145 kg, a bit lower than that of the Elite Runner Pro, the Elite 4000 definitely has some aces in its sleeve when you compare it to other high-end treadmills on the market. For instance, the entertainment options are well beyond what you normally see. The 7-inches full-color touch display isn’t just for monitoring your stats; it also comes with an Android web browser. Besides, there’s the 15-inch HD TV too, but the screen is quite close so it’s not that easy to watch. The Elite 4000 offers you the opportunity to customize your workouts according to your strength and endurance, thanks to its 40 workout apps and an iFit® functionality, which come with a 1-year subscription. On the downside, this machine is incredibly heavy, it weighs even more than the maximum weight it supports, 150 kg. But you can rely on its strength and durability, with a lifetime frame warranty, 10 years for the motor and 2 years for the parts. And you can also fold it, which wins it points in the storage department. Now that we’ve passed the finish line, you can see that the market of good home treadmills is quite varied, with running machines that boast very different qualities. It might seem difficult to choose the right treadmill in these circumstances, but it’s actually not if you take into account the features we discussed in the buying guide. That said, we’re curious which treadmill stole your heart. Which would you get and why? Which model didn’t seem so great? Why do you want a treadmill? Let us know in the comments box below!